RAL P1 and P2 are also available as a complete set of 100 classical colours plus 200 design colourplates in plastic. 300 design options for precise colour communication and innovative products. RAL P2 contains 160 opaque and 40 special, transparent colours. Together with the 100 classic shades within RAL P1 the RAL PLASTICS colour standard now comprises 300 colour samples. Each colour is also available as a single plate. 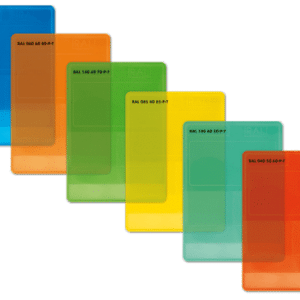 The RAL PLASTICS colour samples are multifunctional and offer many benefits in practice. Three different surface textures and three different material thicknesses give users a realistic impression of how the colours will look when used with different material applications.